Taking a core sample of your commercial roof can give a story of what’s going on inside your roofing system. This client discovered a leak in the roof, however they had no idea how extensive the damage really was. Showalter Roofing took a core sample of the roof and found that water was absorbed into the insulation. The leak in the roof formed once the insulation was completely saturated with water. Contact Showalter Roofing to help keep your roof in great working order. Watch the results of the core sample now. Roof installations can be messy if not performed by a reputable roofing contractor. Find out how Showalter Roofing keeps your home and flower beds clean of debris during roof installations and roof repairs. Watch it now! Rain has finally made its way from the south offering us much needed rain. 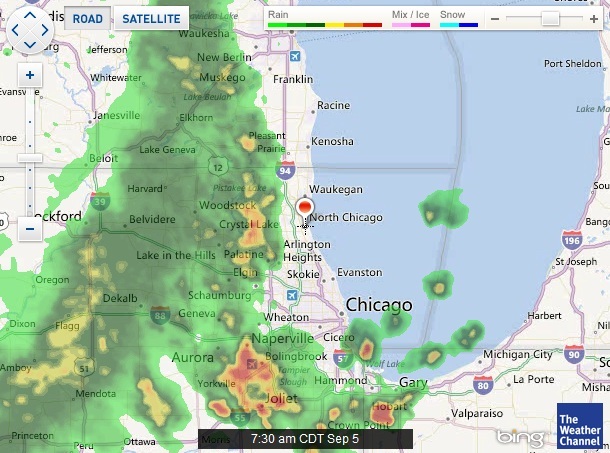 The south suburbs are projected to receive approximately 3″ while the northern suburbs will get about 1″ – 1.5″ of rain. As the rain continues today and tomorrow, keep watch on your home for stains on the ceiling. Stains are the result of leaks in the roof. If we can catch the leak right away, then you can avoid costly damage done to the roofing system as well as your personal items on the inside. Also be sure to check for any missing shingles or wooden shakes. This will be an obvious place for rain water to enter. Remember, just because the rain enters in through one spot doesn’t mean the leak will be directly underneath. Water loves to travel! Be sure to check the entire house for stains as you never know where water might end up…even your skylights! Next time, we’ll talk how water travels in our chimney’s. Let us know if you need a check on your roof. 630-499-7700. Hot! Hot! Hot! What Does the Hot Sun Do to the Roof? Roofing systems expand and contract all the time with cool temperatures and heat. Our recent high temperatures is certainly causing alarm with the stress heat plays on the roofing materials. Roofing membranes expand, seems begin to split and flashing cracks and peels away from the edges are some of the most common areas to watch for changes to occur. The weather can certainly change at a moments notice by adding wind and rain to the hot, stressed materials. With weakened materials, wind can cause pieces of the roofing system to come loose and water finds its way into the interior of the building. If you haven’t had an inspection on your roofing system in at least 6 months, it’s time to have your roof taken care of to avoid damage on the inside and out. It’s a small upfront investment or a much larger one later. Contact us today to have your roof inspected 630.499.7700. Summer storms with high winds, hail and heavy rain can cause extensive damage. Large sections of the roof can come off exposing materials and the interior of the building. To avoid damage, an inspection can identify weak areas saving you thousands of dollars in repairs. If we find loose materials, cracks or other weak areas, we’ll show you the issues and repair the problems before it gets out of control. View for yourself the quality of workmanship for your dollars spent. Learn more about our commercial roofing solutions including repairs. …And we don’t mean the deck in your backyard! We’re all aware of the damage caused by rain and wind to our roofs…but heat? If it’s dry, how can the roof be at risk? Heat builds up in the attic causing temperatures to rise. It becomes more of a problem when the attic is not properly vented. If the heat has no place to escape, it can cause your shingles to blister and crack while making it’s way out. 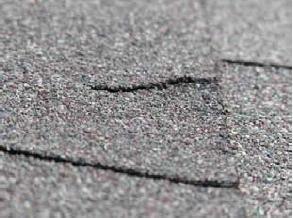 The cracks usually appear around the edges of the shingle, where blistering occurs throughout the entire shingle. You can also inspect your gutters for granules. If you find a large amount of granules, look for an area on your roof where you can see a change in the shingles. Next, take a look in your attic. The heat can cause the plywood of your roof desk to warp or even soften. Using a garden glove, test the plywood with your hands. If it feels soft to the touch, test a few more. Indicate which one’s are the problem. When Showalter comes out to inspect the roofing shingles and roofing deck, we’ll be sure to address your concerns. Climbing on top of your roof is not an easy task. If you think your roof is suffering from the heat, be sure to call us and we’ll inspect and repair it for you.